I’m trying to think of ways to generate note data and patterns whilst also embracing the modular way of thinking. I don’t particularly want to use a traditional note/gate sequencer and I want to make things playable and experimental whilst retaining some level of musicality. The first thing that springs to to mind is to use any CV sequencer of choice and then quantise that information so it locks to note values. You would also need some source of triggering your synth voice so you actually trigger a note if we're talking about a melody or bassline rather than a drone. I think the Euclidean sequencing stuff is very interesting and I had an idea of how to generate interesting trigger patterns that are independent of note data but still having some sort of structure. If you have a Euclidean sequencer like qu-bit pulsar which has one pattern generating the note triggers and others hitting the “step” and “reset” input on an arp like 2hp arp then you can independently control your rhythm pattern and your note pattern. The notes would always be within the limits of the arp setting e.g. three notes in a one or two octaves but the pattern of those notes could have all sorts of interesting variety. It could be a simple 1-2-3-1-2-3 arp or something much more unusual depending on how often you step or reset the arp. Sort of poly-metric relationship between the notes and the triggers. 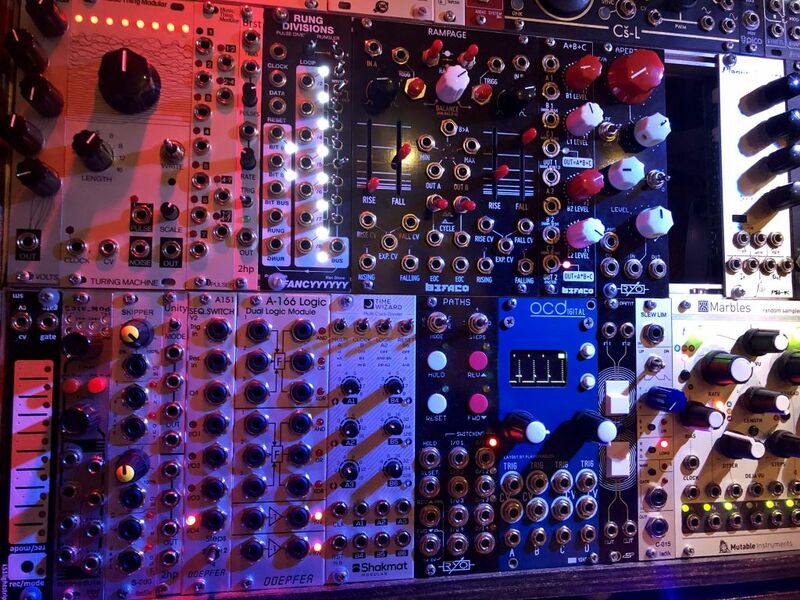 I’ve spent a lot of time in the last day or two looking at eurorack sequencers and I think going down a traditional step-sequencer route isn’t going to help me be creative and come up with interesting stuff. It seem so like the Euclidean stuff could be used in a number of interesting ways. Any other ideas for generating note data and patterns without using traditional step sequencers or large and complex sequencing modules? Trying to get my brain into the modular way of thinking. For cv- SAMPLE AND HOLD. One in sample input one in trigger input. Play with the frequency releationships. Lots of interesting patterns can emerge when the samples oscillator reaches audio rates. Also try complex envelops and waveforms. Ornament and crime is an abundance of ways of generating cv’s. Highly recommend it. For generating gates I love things like the Turing machine and Mables. Mix those outs with some clocks, sequential stitches and logic modules and there’s a lot of fun to be had. The rest of his modular videos are also worth taking a look at. This is the part of my rack deticated to this pourpose. Turing machine, marbles, rung divisions and o and c.
For gates- logic and sequential switches mixing clocks random gates via logic, creating patterns. probability module like my ladik skipper are great for some unpredictability too. I like to use the Pamela's New Workout and a quantizer. I'll take a stepped random waveform from the pams, send it in to a quantizer for my notes. Then will usually use another output from the Pam's and make an interesting gate sequence to trigger an envelope to shape the vca for that melody. I've been fooling around with Euclidean gates driving a Z8000 step sequencer and using the various outputs to modulate other outputs in a VCA Matrix then quantizing in o&c. Results have been mixed, but I think there's some promise to it. If I run the gates through an SSM before hitting the Z8000, I get dramatically different outputs each time the matrix switches.